Anguilla clinched the third position at the Leeward Islands Tournament. They beat Montserrat to step onto the podium at the home tourney. Jason Hodge (201-C/F, college: Oklah.Panhandle) nailed 18 points and grabbed 16 boards for the winners. Montserrat eked out a 15:14 lead ten minutes into the game. They extended the lead in the second term. Montserrat built a 35:28 halftime lead. They maintained the lead throughout the third term. Montserrat secured a 12-point advantage at the final intermission. 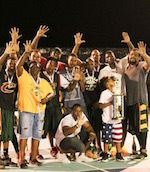 But Anguilla dropped 33 points in the fourth quarter and eked out a tough win at the end. Colin Harrigan (183-G, college: Clinton CC, IA) chipped in 17 points, while Javille Brooks tossed in 16 points for the winners. Walter Weekes (183-PG) answered with 29 points for Montserrat.